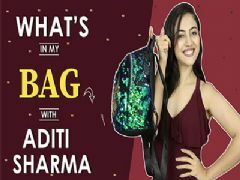 Meera Deosthale who was last seen in the Colors tv show Udaan recently waved the show a goodbye and today we bring to you a fun chat with Meera where she shared about her exit, and much more. We hope that you guys enjoyed this chat with Meera, if you did do Comment and tell us. User Comments on video titled "Meera Deosthale On Leaving Udaan, Future Projects amp; More"
thanks for the lovely surprise. Meera Desothale intvs are always a treat for us fans. she is a sweetheart, iove her.